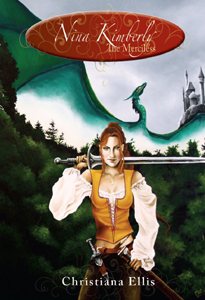 Nina Kimberly the Merciless is a comic fantasy novel about the teenage daughter of a fearsome barbarian conqueror, originally produced in 2006 as a free podcast audiobook. The podcast was an inaugeral nominee for the 2006 Parsec Award for Best Speculative Fiction Long Form and was also nominated for a Podcast Peer Award. In 2010, Foreword Magazine awarded Nina Kimberly the Merciless with the Bronze Award for Best Sci-Fi/Fantasy Novel of the year! The podcast attracted an audience of more than 10,000 listeners, and as a result, is being released in print on May 15th, 2009 from Dragon Moon Press. NINA KIMBERLY THE MERCILESS – AVAILABLE NOW AT AMAZON.COM!!! To celebrate the print release, a brand new version of the podcast novel is being released for free online. The new version features improved audio quality, and a traditional audiobook-style presentation. The original version, now known as Nina “Classic”, features music and sound effects, and will also remain online for free. Nina Kimberly “Classic” Podcast is included in the older episodes of the feed listed above. Click HERE for direct download links for all episodes! Page created on March 28th, 2009 by Christiana. Yes, alas, the May 15th launch suffered a little bit of a hiccup in not allowing more orders. Hopefully it will be resolved very soon! Ha! Just saw the promo vids and died laughing! Tyrnon is awesome! Amazon finally let me order the book. I bought 3, one for me and one for each of my daughters. I am super excited about getting a copy of this book in print. However, I am wondering if there may be a way to get an inscribed copy? This would make an incredible gift for my father, who is a fan of your work. Any possibilities in that regard? Yay! we have been over the top excited to get our books from Amazon! Can’t wait for book two! Who is Teirnan really? What land does he come from? Was William her true love? Will the Ooks stay behind or follow her? Will Francis take good care of her double? ahhhhhh Thanks so much Christiana. OMG I love this book. I listen to it at work through my ipod. can’t wait for the rest of the remastered book to be finished. I love your book btw. I hope to purchase it soon once I find it. OMG I loved the book but I was sad at the end. I expected William to change his mind, and Nina leave kimberly with Francis. I hope for a second book on more adventures. Your work is awesome. I hope to purchase your book soon once I find it. I’m just now listening to the podcast and I’m really enjoying it. Thanks! Love your work! I really enjoyed this book. I too listen to it on my ipod. Are you going to do another? Hi Christiana, I received my copy of this book and, as others have written and really liked it, great book. Great book, my brother want to purchase it for his kindle! please tell me that your writing a second book of nina cause it just feels like there should be another one. Maybe for if she meets the con artist again but in better surcumbstances. I agree the book is so entertaining and it has left me wanting more. Bring on the next book!!! Got any plans for a sequel. I just couldn’t put this book down! I second that on the sequel. Great stuff. Everybody i know loves this book, Is there a second one ? I still haven`t seen anything yet ? I would also love to read a sequel! I, too, loved this book! And I would love to read a sequel, as it seemed as if Nina Kimberly’s adventures were not complete when the book ended! Thank you! What animal was Nina Kimberly 2 before tha advisors made her Nina Kimberly 2. Will there be a sequal? Currently listening to chapter 8, I love it, really funny stuff. Just finished listening to the “Remastered” podcast. A truly great read. You almost had me in tears with your description of Tiernen’s dying moments. A truly great story, but on that is unfinished and just BEGGING for a sequel. Hope I won’t have to wait too long. Listening to my copy of the audio book again, still one of my favorite silly indulgences years later. Hi Chistiana! I love love love Nina’s story! I listen to it via Libravox… I have Lupus and spend so much time in bed to my frustration! But Nina has made so many days not only bearable, but enjoyable. THANK YOU! Sorry, I just saw this, but thank you so much for commenting! It’s always wonderful to hear that one of my stories has touched someone.